For Millennials (also known as Generation Y) the average daily time spent online is 185 minutes, which gives us more than 3 hours! This group is represented by young people, under 35 years old. Next researched group, Generation X (birth date between 1965 and 1981), spent daily almost 2 hours online. 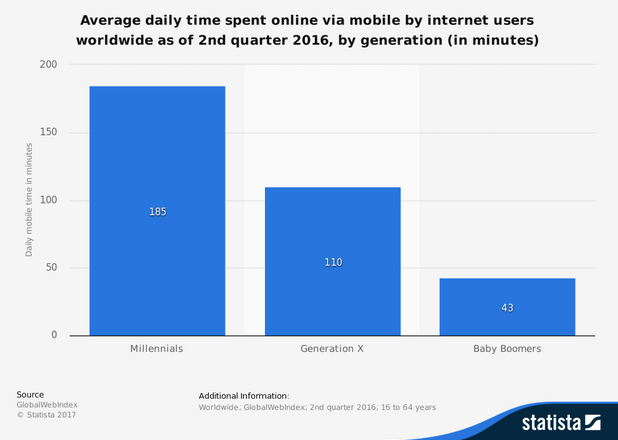 The oldest category called Baby Boomers (born 1946 – 1964), are online more than 40 minutes, which is still an interesting result! Surprisingly, almost each of us take its phone and indiscriminately use a lot of custom-made, dedicated mobile applications. What’s more, typical websites visible in browsers are fully responsive for mobile devices these days. There is no place for pages that don’t adapt its layout for multiple screen resolution, each customer is used to functional and readable websites, as well as applications. There is no doubt - number of smartphone users is still growing. 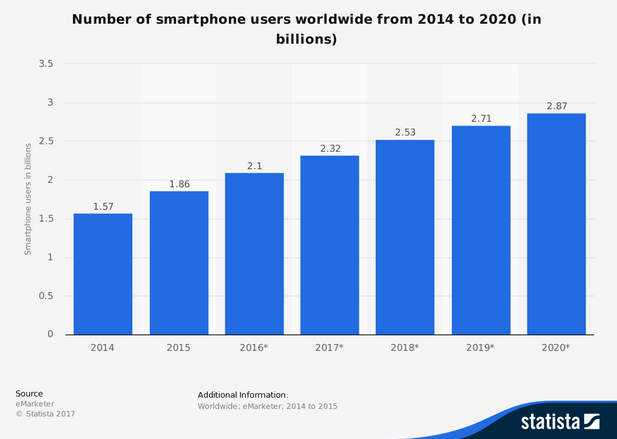 Total number of smartphone users in 2017 is equal to 2.3 billion (! ), and world population is 7.5 billion. What all of them may be looking for? Most of us use mobile applications because it’s much easier to stay connected with friends, be up to date with news from all over the world, see what’s already happening in your neighbourhood, check your bank account balance or local train timetable. Set of reasons is boundless! In business, it’s significant to have a proper strategy. While drawing conclusions from various statistics, we are aware that our current or potential customers are using mobile phone and dedicated apps more often than just searching the web. You can still ponder whether it is profitable for your company to have a dedicated mobile app or not. 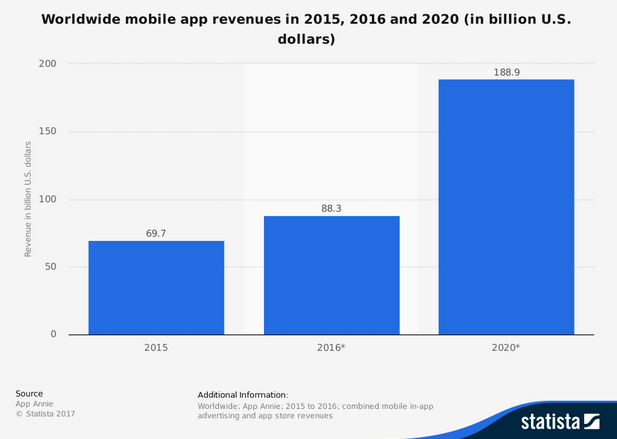 As you can see the forecast for 2020 shows an outstanding growth in mobile app revenues. There are various ways to monetize your mobile app - it doesn’t have to be only a free tool. It may be a kind of profit-generating unit as well. Intrigued, aren’t you? The first thought that is coming to business owner’s mind is advertising and that’s all right. In recent years, communication bridge between advertisers and consumers has notably ameliorated thanks to digital advertising. Of course, there wouldn’t be such growth without people who spend an insane amount of time on their phones. 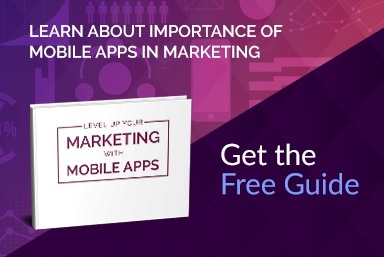 Making your app free and utilizing in-app adverts is a great step for your business! Would you like to stay in touch with your current or previous mobile app users? There is nothing easier than creating an email subscription form to the app. Due to great email marketing strategy, you can gain much more engaged customers, and regular emails (not spam!) helps you keep your brand at the forefront of people’s mind. The same works for SMS marketing - thanks to that you are able to effortlessly communicate with your customers, e.g. send a promo code for your product or services. These are only some of many ways to accelerate your business through the mobile application. According to statistics, the number of mobile app users is extensively rising and we can clearly assume that the mobile app development value will be constantly increasing within the global market. Also, dynamic progress in IT technologies and processes helps us create apps with a relatively low time and effort consuming, but with maximum effectiveness.